Join us at 9:30am for meditation in the Wish-Fulfilling Temple (warm-weather location). Come on in and choose your cushion or chair. The meditation leader will give a brief explanation of how to adjust your mental and physical posture. Quiet meditation includes settling the attention on the breath and then discovering the essential nature of mind/awareness. 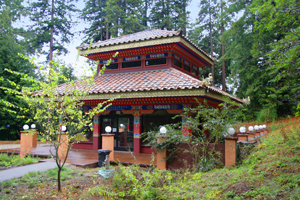 After a quick break to stretch our legs and make any needed adjustments, we sit back down for another 15-20 minutes of contemplation on various Dharma topics – lessons taught by the Buddha and the centuries of later Buddhist masters. Parking: You can drive right up to the parking lot adjacent to the Temple. Just keep going on the paved road – through Tara Redwood School, up the steep drive, turn Left at the top of the hill, go through the electronic railroad-style gate (which will hopefully be open). Timing: PLEASE arrive on time. If you are late, please wait until the BREAK (at approx. 9:55am) to come in. Leave the other meditators in peace. Thank you.